From the help of Scott in Alabama at Steyr, just got myself a new Z2...and many thanks for all the reviews here about the gun. I'm not driving tacks, but shooting steel plats and such at 50-100 yards. I prefer something with a small footprint, what are some ideas? ALso, as of 3/19 the shop where I got mine has, get this.....all 3 calibers in stock. But just one of each, non threaded bbls, and the wood on the 22lr is very good (it's dark) and they all have test targets AND the old price of $899. Welcome to the gang, enlighten me, what color is your trigger? Is your trigger guard plastic? Learn to post photos, it is a forum requirement after the first 5 days of account activation you have to post a sample photo to continue posting. Hmm sounded good but that isn't true. Anyway, to address your scope question you would have to define small. Probably two of the smallest scopes I can recommend is the Burris Timberline 4.5-14x32 with AO. 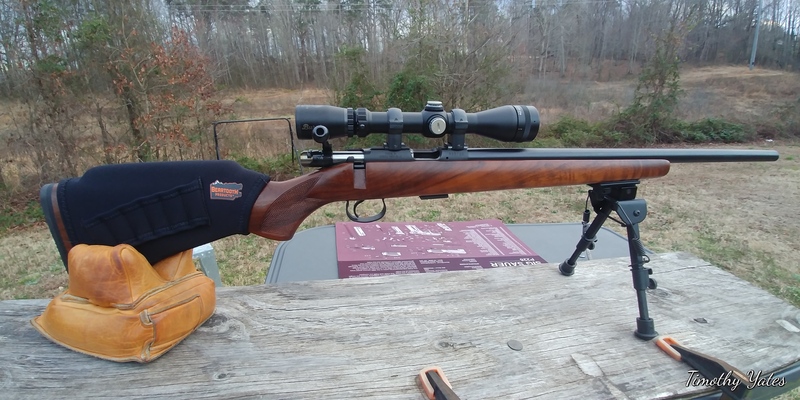 I have this scope mounted on my CZ 452 Varmint. Here is another small scope, the Weaver 3-9x32 AO. This is mounted on my CZ 452 American with 16.5" factory threaded barrel. Between these two, the Weaver is most clearest but the Burris is more versatile. I believe the Burris was cheaper too. The best small scope I have is the Vortex Razor HD LH 3-15x42 with Parallax adjustment. Here it is on my Zephyr II. I wanted to give you an idea of what these scopes looked like in size when mounted. The Vortex is by far the best in all areas of performance. As for the specifications, I'll let you read about those on MFG website if interested. Hey KOD, thanks for the info. I'll check out your scope suggestions. The shop was really suggesting their Swarovski Z3 3-9(or 10, I forget) with a parallax set at 50 yards. It really sounded good to me, but I've never had a scope with AO settings...the glass was amazing, and I'm really tempted to get it...but not sure if I'll miss out on the AO feature. Any words O wisdom on that? I won't put a non AO scope on my rimfires. I think if a dealer is trying to sell you one or a 50yd minimum parallax scope for a rimfire and especially a hunting rifle they really don't understand the application or they are just trying to sell product. If it were me I would look around for a AO or side focus scope that goes down to 10 or 20 yrs minimum to compliment the rifle. That's just my opinion but it is based on experience, some may not agree. grg, I would agree. I have a Kahles 6-24x56 that is fantastic in every respect but the parallax setting only goes down to 50 meters. My targets are set at 55 yards so the scope worked for that but anything closer and the target was blurry. I didn't even check to see if the x-hairs would move around, it didn't matter if the target was blurry. I use that scope mainly on my 5.56 AR with Seekins lower and Larue upper. I was using it as a "floater" scope until I got my Weaver T36. bls72bmw, for a rimfire, I would also advise against any scope without a PA and against one that doesn't go down past 50 yards/meters. My Weaver goes to 10 yards, Burris to 7 yards and the Vortex to 20 yards. The Weaver and Burris are meant to be rimfire scopes while the Vortex isn't necessarily. I ask about the trigger color and bottom plate material because some people claim to be getting a plastic bottom and not gold trigger. A good small optic as you requested could be a Leupold VX3i 2.5-8X. It is small in size, crystal clear picture, and more than adequate for the shooting you describe. I have one and it looks great on a smaller rifle like my Remington 541-S. I've been looking to buy a SZ II and will scope it with something similar. OHHH, you LUCKY! Jealousy is such an UGLY emotion! I've had Weaver Rimfire Classic scopes on my rifles for more than 20 years...both the 2.5-7 X and the 4 X. If you want "excellent" instead of just "superior", go for the Leupold Rimfires. Other than that, the Weavers are compact, sized just right for .22 rifles. Warranty? Dunno, never had to use it. Good luck!